Honeywell Miller. Synonymous with Safety, Quality, and Innovation. 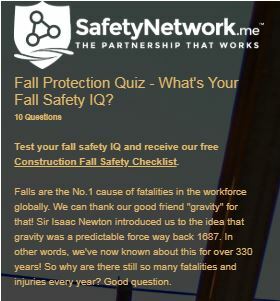 For details on Miller Fall Protection, go to https://www.millerfallprotection.com. Safety Plus Inc is a full-service safety management firm providing high-quality loss control services for companies across the United States. Our mission is to deliver an aggressive, customized risk management service that reduces employee and subcontractor-related risks generating a significant return on investment through our proprietary software (SafetyPlusWeb™), contractor management program (SiteTracker), complete safety management program (Virtual Safety Manager), and our Site Safety Personnel staffing network. If you have safety questions, need a complete, top-to-bottom safety program, or need help with just one aspect of your safety management plan, Safety Plus can offer your organization the support it needs. For details on Safety Plus Inc., go to https://safetyplusweb.com/safety-management-software/. Your wiki for safety people by safety people. Safety standards, best practices, innovation, and legislation are constantly changing. There are thousands of formal and informal safety committees, dozens of safety certifications and thousands of courses. How do EHS professionals get the information they need quickly and easily? How can they spend less time behind the desk and more time in the field keeping people safe? We aim to be the simple resource safety professionals turn to for all things safety. Join the movement or provide your feedback @ https://www.safeopedia.com. 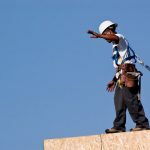 So, What Are The A-B-Cs of Fall Protection? 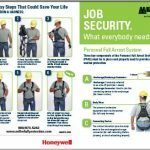 If there is no way to eliminate all fall protection hazards, employers must provide employees with a personal fall arrest system. Three key components of the Personal Fall Arrest System (PFAS) must be in place and properly used to provide maximum worker protection. Individually these components will not provide protection from a fall. 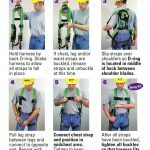 However, when used properly and in conjunction with each other, they form a Personal Fall Arrest System that becomes vitally important for safety on the job site. Download this wallet card for your team. 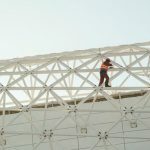 Safeopedia.com and SafetyNetwork.me put together a simple quiz for you, or your workers, to test your/their safety knowledge. 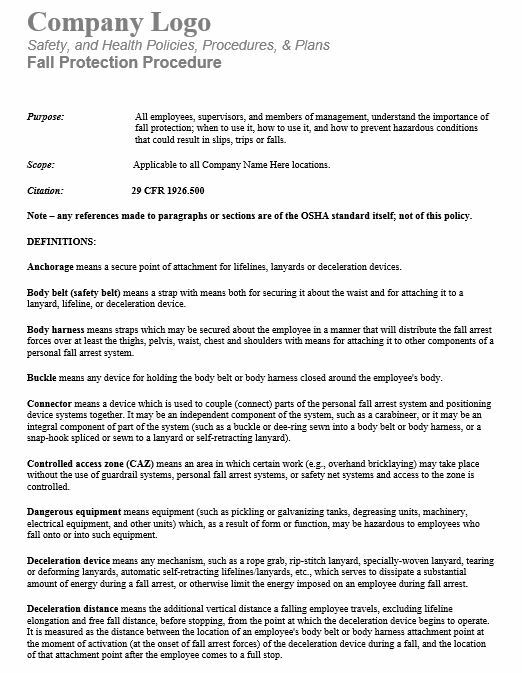 If there is no way to eliminate all fall protection hazards, employers must provide employees with a personal fall arrest system. An early step for every company with employees working in dangerous environments is writing a fall protection plan. Safety Managers are responsible for writing and updating a plan that ensures that their company’s workplaces and practices are structured to prevent employees from falling off of overhead platforms, leading edges, open-sided floors, elevated work stations or into holes in the floor and walls. The purpose of the plan is to identify, manage and control the fall hazards by eliminating them with fall prevention methods. When this is not possible, employers must install or provide fall protection equipment or systems to guard against falls from elevation. This written program needs to address how the employer will manage and control existing fall hazards. OSHA provides a Sample Fall Protection Plan that outlines the elements that must be addressed in any fall protection plan. Miller Fall Protection provides guidance on Developing a Fall Protection Program. Our safety partner, Safety Plus, Inc., has provided an editable fall protection policy (MS Word format) that you may download and use for your business. 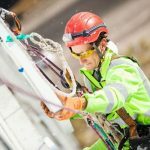 Selecting the right anchorage is an important part of ensuring your fall protection system is maximally effective. 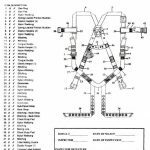 To view Miller's full line of Anchorage Connectors & System Kits click here. Six easy steps could save your life. > Download and share with your co-workers. 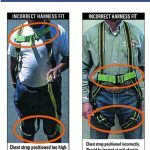 These images show the correct and incorrect way to wear a harness. Which image reflects you? Fall harnesses have to be inspected before every use, even when you're working alone. Learn what to look out for to keep yourself safe. 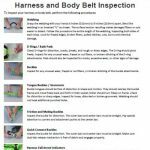 Walk through a visual inspection of harnesses and body belts. To view Miller's full line of Body Wear click here. Choosing the right lanyard is as important as choosing the right harness. 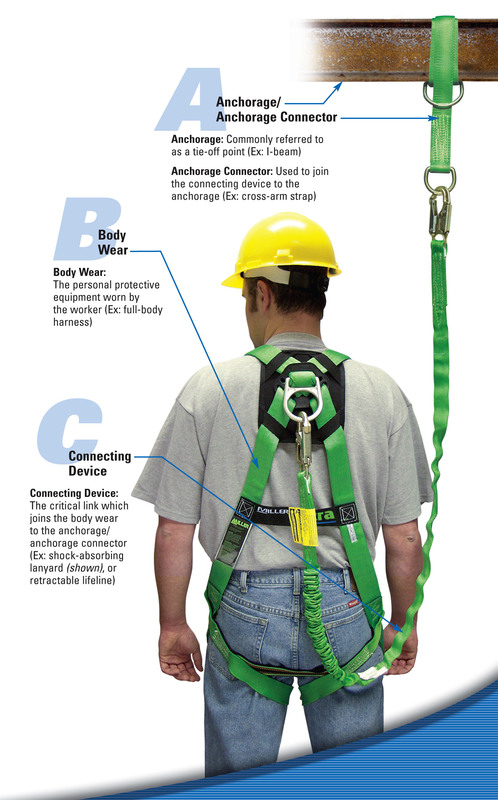 Find out what you should consider when equipping your fall protection or fall arrest system. If you are new to using SRLs, check out these safety considerations. 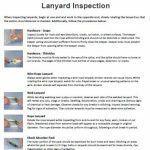 Download this visual lanyard inspection guide for your workers. 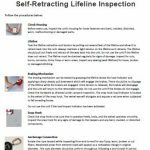 This download provides a visual guide to inspecting SRLs. To view Miller's full line of Connecting Devices click here. 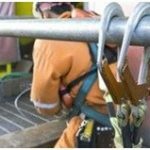 When working at height, it is important to know your fall clearance and swing fall whether using a shock-absorbing lanyard or self-retracting lifeline (SRL). Calculating your fall clearance and swing fall is critical to your safety. Access the Fall Clearance Calculator here. This 65 page guide will walk you through and help you document a full product inspection. 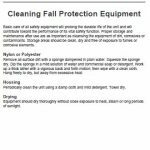 Tips on cleaning your fall protection equipment.